Teens, Invisible World events focusing on forensic science, microbiology and medicine are coming to a branch near you in early 2019. This is a chance to explore much of the typically "unseen" world through the hands-on lab techniques. 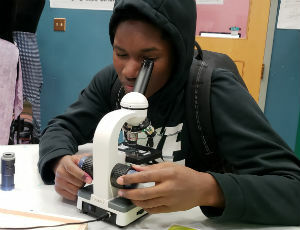 From learning about extracting DNA from a strawberry to observing "alien-like" creatures crawling around under the microscope, the STEAM adventures are unlimited. Invisible World events begin in January and run through May. Our YOUmedia STEM program trainer Jenny Kljucaric, who has a background in art and 3D printing—plus exceptional project management skills, spent several months researching techniques using Next Generation Science Standards and evaluating tools before designing and leading staff in a series of trainings focused on developing dynamic STEM-focused spaces and facilitating hands-on forensic science workshops. Our staff members are incredibly excited about the new supplies they'll receive to take deeper dives in water microbe safaris and more. You can follow and contribute on Instagram using #CPLInvisibleWorld. Chicago Public Library Teen Services' Invisible World programming is supported through Motorola Solutions Foundation through the Chicago Public Library Foundation.